Every hour of the day, every day of the week, and every month of the year, a group of individuals volunteer their time to greet troops who arrive at the airport in Bangor, Maine. These volunteers are a diverse segment of the population: old, young, rich, poor, veterans, and civilians. Yet, they all have one goal in common: to welcome home troops from deployment, and wish them well on their way to war. Since March 2003, over one million troops have been greeted by these volunteers. Regardless of the weather conditions or time of day, the troop greeters are on hand to show their appreciation and gratitude to those who serve overseas. They offer hugs and handshakes, cell phones to call loved ones, and snacks to feed their hunger. “Thank you for your service” and “Welcome Home” are not hollow words, but come from deep within the heart. 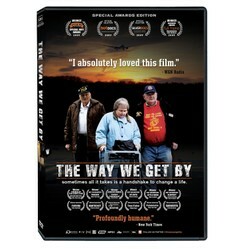 The Way We Get By is a documentary about the troop greeters of Bangor, Maine. Yet, it is more than a film about greeting our troops. It is a powerful story about aging, loneliness, courage and death. It will touch your heart, put a tear in your eye, and in the end, make you proud to be an American. The Way We Get By is not a movie about war. It is an intimate look into the personal lives of three of the elderly residents of Bangor, Maine who volunteer as troop greeters. They suffer through the aches and pains of aging, the loss of loved ones, and the financial burdens that comes of being on a fixed income. It is a touching story; it will make you heart heavy with sadness, only to be lifted with pride. By watching this film, you’ll realize how much the elderly need our support and appreciation, and how much we have to learn from their past experiences. Bill is an 88 year old WWII veteran who served in the US military for over 32 years. An ailing widower, he shares his home with a dog, several stray cats, and a lot of trash. He has recently learned he has prostate cancer, and wants to make the most of the little time he has to live. Joan, 76, is the matriarch of a large family. She has had several knee surgeries, and finds it difficult to get around. Joan’s late husband was active during the Korean War, and two of her twelve grandchildren are heading to Iraq soon. Her granddaughter is a Blackhawk helicopter pilot, and Joan fears for her safety. While Joan welcomes home the troops, she is unwilling to say “goodbye and good luck” when they deploy. Jerry is a 74 year old retired steel worker. He lost his 10 year old son after a brief illness, and decades later, is still having difficulty dealing with the loss. He spends his time sitting in his truck with his dog, Flanagan, reading the newspaper and waiting for troops to arrive. This film follows the lives of each of these troop greeters, relating the personal struggles in which they deal each day. Bill Knight suffers from loneliness, disease, and financial problems. He wants his life to have meaning, and believes that volunteering as a troop greeter brings that meaning to life. His loneliness is so profound that you wish you could give him a hug, or help out in some way. Joan Gaudet has been a widow for 14 years and finds that volunteering provides her with a reason to get out each day. Although several members of her family are in the military, she is confused about the United States’ place in the war. Her granddaughter is preparing to deploy, and she must come to grips with this reality. Jerry Mundy is a loner who spends most of his time with his dog, thinking about his family and his life. He has a deep appreciation of the United States and of the troops, and would go to war if the military would take him. Having lost a son himself, he knows that it is difficult for the parents when their children go to war, but don’t make it home alive. Spending time as a troop greeter helps ease the pain of his loss, although he realizes nothing will make it go away completely. You must watch this film in its entirety, as it doesn’t end as you would expect. It is a movie of hope and sadness, of the struggles of aging, and how giving of oneself returns rewards tenfold. It is an inspirational film that you will want to watch once again, and share with everyone you know.